MRV stands for Measurement (or estimation), Reporting and Verification. The UNFCCC provides official guidance for measurement (or estimation), reporting, and verification of greenhouse gas emissions and mitigation actions at the national level. The guidelines for measurement of greenhouse gas emissions within the context of reporting to the UNFCCC are well established. Measurement of GHG emissions in developing countries’ national GHG inventories should follow IPCC 1996 Revised Guidelines. Use of more recent IPCC (2006) guidelines is optional. The UNFCCC, and the Paris Agreement also directs developing country Parties to measure (or estimate) the effects of domestically and internationally supported mitigation actions (such as Nationally Appropriate Mitigation Actions). This type of MRV is voluntary, and there are no prescriptive guidelines; countries are intended to create their own systems according to their circumstances and priorities. While this has allowed more flexibility, it has also created some confusion as to what constitutes MRV of a mitigation action and what minimum acceptable practices might be. Reporting and verification guidelines are also prescribed by the Convention. Each developing country party is required to submit a National Communication every four years and a Biennial Update Report every two years. The purpose of these reports is to provide updates on actions undertaken by a Party to implement the Convention, including the status of its greenhouse gas emissions and removals, as well as on the actions the Party has taken to reduce emissions or enhance greenhouse gas sinks (such as forests). Verification processes differ depending on the type of report. 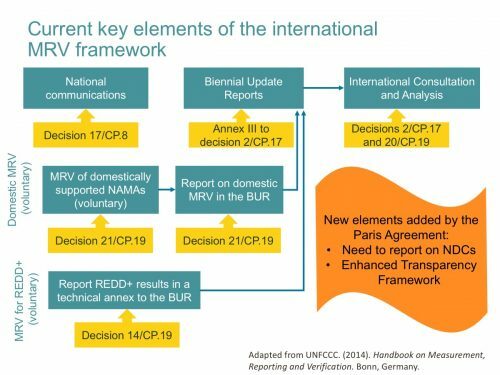 The 2015 Paris Agreement added two new layers to the UNFCCC MRV framework: the need to report progress on Nationally Determined Contributions (NDCs), and the establishment of an “Enhanced Transparency Framework.” The Enhanced Transparency Framework is still under development, but it will eventually supersede the existing procedures and guidelines for MRV. Requirements for measurement of GHG emissions under the UNFCCC are covered in the 1996 and 2006 IPCC guidelines for national GHG inventories. For measurement of the effects of mitigation actions, there is limited agreed methodological guidance under the UNFCCC. The one exception to this is REDD, where more detailed methodological guidance has been agreed upon. Guidance on the preparation of National Communications requires developing countries to provide information on steps taken in the implementation of the UNFCCC, including mitigation actions. Guidance states that: “based on national circumstances, non-Annex I Parties are encouraged to use whatever methods are available and appropriate in order to formulate and prioritize programs containing measures to mitigate climate change.” Guidance for BURs requires that “information on methodologies and assumptions” is given “to the extent possible” and that domestic measurement, reporting and verification arrangements are described (See Text Box 5 in Guidance for BURs). voluntary, pragmatic, non-prescriptive, non-intrusive and country-driven, take into account national circumstances and national priorities, respect the diversity of nationally appropriate mitigation actions (NAMAs), build on existing domestic systems and capacities, recognize existing domestic measurement, reporting and verification systems and promote a cost-effective approach. Parties shall account for their nationally determined contributions. In accounting for anthropogenic emissions and removals corresponding to their nationally determined contributions, Parties shall promote environmental integrity, transparency, accuracy, completeness, comparability and consistency, and ensure the avoidance of double counting, in when recognizing and implementing mitigation actions with respect to anthropogenic emissions and removals, Parties should take into account, as appropriate, existing methods and guidance under the Convention, in the light of the provisions of paragraph 13 of this Article. The UNFCCC obliges all Parties to report information on their GHG emissions to the Conference of the Parties (COP), and on the steps taken to implement the Convention. This is done through National Communications. COP 8 (2002) adopted revised guidelines for the preparation of National Communications. COP 16 (2010) agreed that developing countries should submit National Communications every 4 years, and that a Biennial Update Report (BUR) should be submitted every two years. By contrast, Annex I developed countries are required to submit National Communications every 4 years, Biennial Report every 2 years and a National GHG Inventory annually. Guidelines for National Communications indicate that National Communications should report information on a number of topics, including the national GHG inventory and information on policies, programs or other steps implemented or planned to mitigate climate change. Developing countries are also encouraged to report information on institutions and procedures for the establishment of a regular national GHG inventory process, and on efforts undertaken to develop emission factors and activity data. Biennial Update Reports (BURs) should include updates to the most recent National Communication in areas including the national GHG inventory, mitigation actions and their effects, and domestic arrangements for MRV. The national GHG inventory section of the BUR should consist of a national inventory report “as a summary or as an update”, including two overview tables required in the NC guidelines. Additional or supporting information, including sector-specific information, may be supplied in a technical annex. Based on national circumstances, non-Annex I Parties are encouraged to provide, to the extent their capacities allow, information on programs and measures implemented or planned which contribute to mitigating climate change…including, as appropriate, relevant information by key sectors on methodologies, scenarios, results, measures and institutional arrangements. (e) Information on international market mechanisms. Parties should provide information on the description of domestic measurement, reporting and verification arrangements. Verification of information in both National Communications and BURs may be conducted domestically at national level before submission to the UNFCCC. National Communications are not subject to international verification, but information from the National Communications submitted by developing countries is compiled and synthesized by the UNFCCC Secretariat. The Consultative Group of Experts (CGE) provides technical support and advice to developing country parties on the preparation of their National Communications. This work involves analysis of National Communications and recommendations for the improvement of National Communications. These tasks are not, however, part of the formal verification framework under the UNFCCC. With regard to BURs, however, a verification framework has been agreed, which is referred to as International Consultation and Analysis (ICA). The aim of ICA is to increase the transparency of information reported in BURs, including information on mitigation actions and their effects. ICA is conducted through technical analysis of BURs by teams of technical experts, followed by facilitative sharing of views in a workshop convened by the Subsidiary Body for Implementation (SBI). Key source category analysis: Less than half of developing countries conducted key source category analysis. The vast majority of those that did found that at least one livestock emission source was a key source category. Completeness: Of the 140 countries, 139 reported CH4 emissions from enteric fermentation, 134 reported CH4 emissions from manure management and 115 reported N2O emissions from manure management. 116 countries reported N2O emissions from application of animal manure to agricultural soils or dung and urine deposit on pasture. In some cases, misunderstanding of the IPCC Guidelines on reporting of manure and dung contributed to omission of one or more of these emission sources. Consistency: Of the 119 countries that reported emissions for more than one year, 37 presented inconsistent time series, mostly due to a change in the inclusion or omission of one or more manure or dung emission sources. Accuracy: Twenty-one out of 140 countries used a Tier 2 approach to estimate some or all livestock GHG emissions. Only five of these countries have a Tier 2 approach that reflects changes over time in management or productivity, or have updated emission factors between submissions. Out of 140 countries, 89 made no analysis of the uncertainty of livestock emissions. Of 29 countries that reported livestock-related inventory improvement plans: 13 reported a need to improve both emission factors and activity data; 11 reported a need to improve activity data only; five reported a need to improve emission factors only. Just one of these countries is considering moving to a Tier 2 approach that uses regularly updated data to automatically reflect changes in productivity in the way emissions are calculated for any given year. Transparency: Most countries submitted a summary of the GHG inventory as part of an NC or BUR. The extent to which full information is provided in the summary varies significantly: 41 countries neither explained the source of livestock population data nor presented population data; 23 countries did not mention the tier approach used in estimation of emissions; of the 32 countries omitting one or more livestock emission source, 20 gave no explanation for this omission. Quality assessment: The quality of livestock GHG emission reporting by 140 countries was assessed using a scoring approach. The scoring indicated considerable variation in the quality of reporting. For the average country assessed, low scores were mainly due to poor practices contributing to inventory accuracy, but there were also often shortcomings in relation to inventory consistency and transparency. Within accuracy, the use of Tier 1 approaches was the main reason for poor inventory accuracy, but lack of uncertainty analysis also contributed to low accuracy scores for many countries. Options for inventory improvement: The function of GHG inventories in national policy varies. Where policy objectives prioritize improvements in the accuracy of emission estimates in a given year, priorities for improvement are key source analysis, followed by improvements in data on livestock populations, improved characterization of production systems and livestock sub-populations, and feed intake and digestibility estimates. Where policy objectives prioritize presenting an accurate trend in livestock emissions (e.g. in response to changing productivity or specific mitigation actions), the priority is to structure a Tier 2 approach so that changes in productivity can be reflected in the inventory. Practical options and specific inventory compilation practices matched to these policy objectives may vary. Sources of data and methods that support improved accuracy for a given inventory year may not contribute to increased accuracy in tracking emission trends, while pragmatic methods used to improve the accuracy of trends may not all achieve high accuracy in a given year. In the light of these varying policy objectives, stakeholders in different national contexts may wish to further consider what constitute acceptable inventory compilation practices.